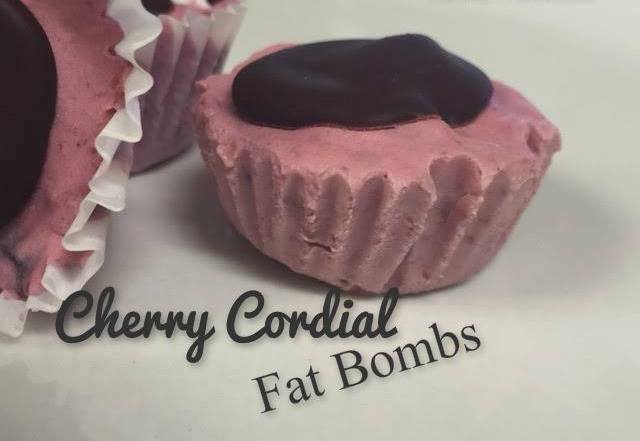 A decadent cherry fat bomb perfect for a low carb snack! If you love cherries you’ll love this amazing recipe. Perfect for a snack on the go! 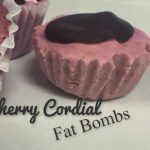 If you are following a ketogenic diet or a low carb meal plan fat bombs are one of the easiest snacks you can make ahead. They can be stored in the refrigerator or freezer for when you need to grab something small to eat. Even though they are small they are quite filling and do the trick between meals. Also great for on the go but remember if you are in a warm environment they could melt. They should be kept cold. Using a hand mixer, combine cream cheese, 4 Tbsp butter, 1/4 c coconut oil, lemon juice and 1 pk of Stevia, add more to taste if needed. Line mini cupcake pan with cupcake holders. Add 1 Tbsp of mixture to each cup. Place in freezer 3-4 hours until set. Melt chocolate, 1 Tbsp coconut oil and 1 pkt of Stevia or more if needed. Put a drop of chocolate on each cup and spread it into a thin circle. I assume the cherries gets mixed in with step 1? Probably stuck in the middle between layers or mixed in with cream cheese for flavor and color. did anyone try this? did you defrost the cherries? did you put them in with step 1?